The next four featured felines are those for which I shot passible portraits that were held back with hope of making something better. Time is come to let them loose, like we did with Abby the Bengal, who was profiled one week ago. First among them is Stella—and that is her real name—whose likeness I captured with Leica Q on March 6, 2018 at 11:35 a.m. PST. On other occasions, I had seen Stella looking out the screen door of a house on Monroe near Alabama but unsuccessfully captured the moment. 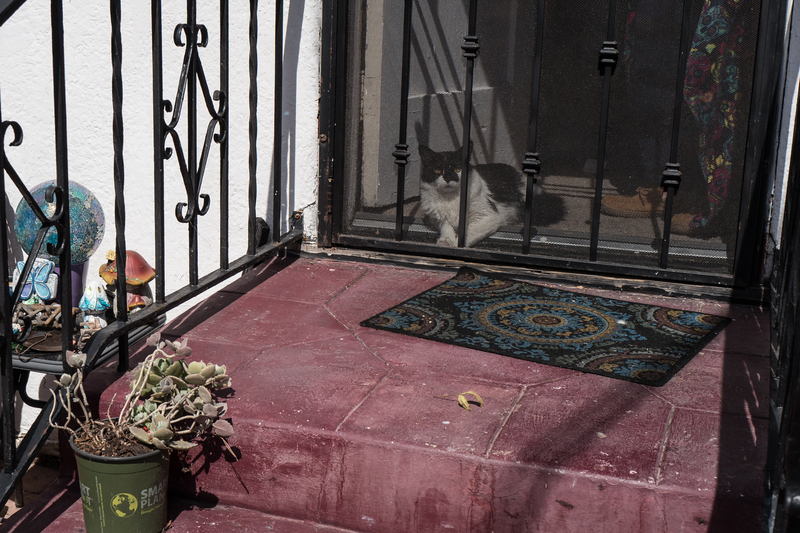 On this morning, her owner was inside with her, and I asked about taking her photo. “Everyone does”, he answered, opening the door and trying to coax the fluffball outside. She wouldn’t budge. Composition is so-so, and the Featured Image is best among my worst attempts. The portrait’s perhaps saving quality: Complimentary color hues throughout; the steps, doormat, and the gent’s pajamas, among other objects. Vitals, aperture manually set: f/5.6, ISO 100, 1/1000 sec, 28mm. Some days later, the dude put up reed fencing for privacy—and perhaps to keep Stella within the small yard. The barrier also keeps out my camera. BTW, Bruce and Guido live across the street on the same block. They reside with a third tiger tabby, whom I have yet to see. You might also enjoy: Scruffy, Roly Poly, Woo, Skull, Biscuit, The Colonel, White, Chipper, Frisky, Stretch, Needy, Farfisa, Mates, Hunter, Pee-Pee, Blue, Blue Too, Bonded Pair, Patience, Fess, Jumper, Frenemy, Looker, Cozy, Scout, Lurks, Skit, Mini, Betty, Black and White, Stalker, Bell, Chill, Sammy, Scratch, Poser, Star, Grey and White, Watcher, Herman, Comet, Roman, Willow, Chub, Nimbus, Watson, Lilo, Kit, Pepe, Twilight, Sebastian, Spot, Booger, Ash, Veruca, Riley, Mellow, Bonde, Flower, Glass, Black, BeBe, Fang, Bruce, Siamese, Pounce, Tortie, Haiku, Fraidy, Peso, Daniel Tiger, Dusk, Stride, Dainty, Spry,Tabby, Betty Too, Still, Levi, Shadow, Sophie, Wink, Ferals, Momma, Charlie, Tux, Cool, Benny, Jellicle, Itchy Valentino, Goldie, Nine, Amanda, Siesta, ChaCho, Charlie, Too, Mika, Crystal, Seeker, Mittens, Dancer, Smokey, Monkey, Captain Blackbeard, Season, Maven, Tink, Chunk, Curious, Hanoi, Bella, Tarry, Guido, Maxine, Mr. Kitty, Peohe, Panda, Frankie, Sunshine, Twain, Willow, Too, Brawn, Reddy, Burglar, Laramie, Lupe, Bright, Tom, Charm, Buddies, Boss, Ohana, Seer, Fresh, Token, Lola, Carl, Bramble, Finny, Cal, Tipsy, Zander, Mew, Penny, Charlie (the Third), Bob, Apple, Persepolis, Sebastian, Too, Holiday, Snow, Desire, Luci, Torbie, E.T., Bushy, Cali, Precious, Gracie, STAR, Sky, Amble, Aylin, Lucky, Herbie, The Love Bug, Roadie, Harley, Wonder, Dizzy, Moophie, Lucy, Choontzy, Abby, and Kitty.